A new map of the universe – based on observations of 1.2 million galaxies – confirms cosmologists’ theories about the web of galaxies making up our universe as a whole. View larger. | This is one slice through a new map of the large-scale structure of the universe. This image contains 48,741 galaxies, about 3% of the full dataset used to create the entire map. Grey patches are small regions without survey data. Image via Daniel Eisenstein and SDSS-III. The Sloan Digital Sky Survey III (SDSS-III) has released new data in the form of the largest three-dimensional map of our universe so far. 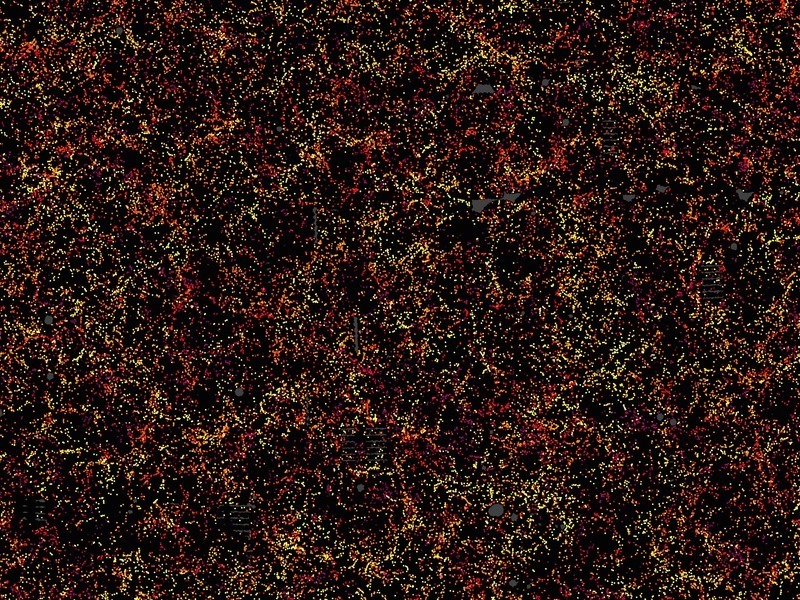 It’s a map of 1.2 million galaxies over a quarter of the sky and over a volume of space of 650 cubic billion light-years. Hundreds of scientists worked together for 10 years to create this map of the cosmic web of galaxies and to use its data to make one of the most precise measurements yet of dark energy, the mysterious force causing an accelerating expansion of our universe. A collection of papers describing these results was submitted this week (July 14, 2016) to the Monthly Notices of the Royal Astronomical Society. Our latest results tie into a clean cosmological picture, giving strength to the standard cosmological model that has emerged over the last 18 years. In other words, current theories of cosmologists – who give us our picture of the universe on the largest possible scales – are alive and well. Before we go on, look at the image above, and take a moment to think about the universe as a whole, as modern theories describe it. Each dot in the picture at top indicates the position of a galaxy. The image covers about 1/20th of the sky, a slice of the universe 6 billion light-years wide (thus we see some of these galaxies 6 billion years into the past), 4.5 billion light-years high, and 500 million light-years thick. Color indicates distance from Earth, ranging from yellow on the near side of the slice to purple on the far side. Note that the dots – the galaxies – are highly clustered. Delicate clustering such as this is a key feature of modern cosmological theories, which describe the universe as a vast cosmic web, whose filaments contain huge galaxy superclusters, with voids in between. Modern cosmologists believe this entire structure, the structure of our universe as a whole, was seeded in the first fraction of a second after the Big Bang. View larger. | This is a section of the 3-dimensional map constructed by BOSS. The rectangle on the left shows a cut-out of 1000 square degrees in the sky containing nearly 120,000 galaxies, or roughly 10% of the total survey. The spectroscopic measurements of each galaxy – every dot in that cut-out – transform the 2-dimensional picture into a 3-dimensional map. Image via Jeremy Tinker and SDSS-III. Taken as a whole, the new map helps to reveal the vast scale of our universe, which is thought to contain more than one 100 billion galaxies. How do modern cosmologists study such a vast universe? Sound waves that propagate in the early universe, like spreading ripples in a pond, imprint a characteristic scale on cosmic microwave background fluctuations. These fluctuations have evolved into today’s walls and voids of galaxies, meaning this baryon acoustic oscillation (BAO) scale … is visible among galaxies today. 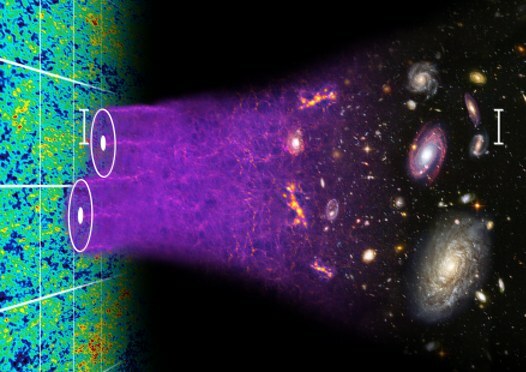 Artist’s illustration of the concept of baryon acoustic oscillations, which are imprinted in the early universe and can still be seen today in galaxy surveys like BOSS. Image via Chris Blake and Sam Moorfield/ BOSS. This map has allowed us to make the best measurements yet of the effects of dark energy in the expansion of the universe. 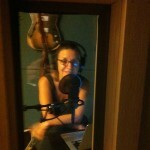 We are making our results and map available to the world. If we were to scale the volume of our survey to a cube 1 mile on each side, then the visible part of an individual galaxy would be about 1 millimeter across. Our challenge in the analysis of this map was equivalent to measuring the distances between all the pairs of galaxies separated by 100 yards throughout a cubic mile of space! How galaxies evolve in the cosmic web. Three scientists answer your questions about dark matter. Bottom line: Hundreds of astronomers around the world, affiliated with the Sloan Digital Sky Survey III, compiled a new map of the universe based on observations and measurements of 1.2 million galaxies over a quarter of the sky. The observations match well with modern cosmological theories. Via the Max Planck Institute for Astrophysics and SDSS-III.